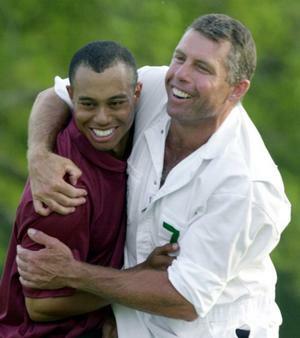 Today, Tiger Woods fired his longtime caddie Steve Williams. With Williams holding his clubs, Woods took home 63 PGA Tour victories, including thirteen majors. Williams, who was there for the Tiger Slam, joins Butch Harmon and Hank Haney as former Woods employees. With Williams now no longer with Woods, the legendary golfer has no links to his most successful days as a golfer. With his caddie, swing coaches, wife, and even his putter now gone, Woods is struggling to get back on top of the Golf world. Williams protected Woods and worked solely for the golfer. The firing comes as a surprise. According to Woods’ former swing coach Haney, Williams helped Tiger in many situations. Williams talked Woods into using clubs other than what he wanted and led Tiger to successful shots numerous times. [readnext]Williams’ knowledge is legendary as he has assisted golfers including Woods, Raymond Floyd, and Greg Norman to over one hundred total wins. The reason behind the split is unknown. The split itself is a shock as Woods and Williams are close friends off the field. Williams is now working with golfer Adam Scott. The remaining question is who is going to be the new right hand man for the great Tiger Woods?